Clear Skin: The one universal beauty truth. 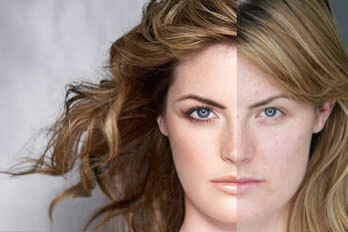 The Ponderance blog shows the excellent Dove Real Beauty video (via YouTube), in which a rather unassuming woman is transformed into a billboard model: Ponderance: Real Beauty Vs Photoshop (or: An Important Video for Young People). The Photoshop Lab presents a quick tutorial on how to instantly add years to someone's face, using Salma Hayek as an example: Aging People.